Dreaming for bright career is the first priority of a young student and rightly so; you have taken a right decision to do MBA but you are expected to know and understand or at least have some idea of different markets. The Worth of Sugar Industries of India can be estimated to be around Rs.75000 crores. The sugar industry is the second largest agro –based industry with millions of people like farmers, middlemen, sellers, buyers, wholesalers, agents involved either directly or indirectly. 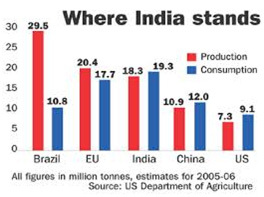 India has around 660 sugar factories with an estimated annual sugar production of 30 million tons of sugar. India also accounts for around five million hectares of agricultural land under sugarcane cultivation. In terms of Sugarcane mills, India is placed first out of the world total of 2500. What ails the sugar industry? 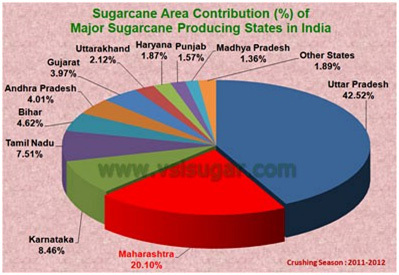 In India, about one third of the sugar cane productionsis utilized for domestic consumption, namely to make Jaggery for their own use, this causes shortage of raw materials for the sugar mills. The output of sugar is also influenced by the relationship between cane prices and jaggery price. The Sugar industry has a seasonal character and the crushing season is about four to seven months a year, thus the mill and the workers involved in Sugarcane cultivation, production remain idle for the remaining term. This creates a financial burden on these workers. They in turn migrate to other places, seeking greener pastures while the mill owners might be forced to sell off his property to sustain himself. Most of the mills, especially mills belonging to Uttar Pradesh and Bihar are very old. These mills are working with outdated and ancient machinery leading to low production of molasses. The low production reduces the amount of profit, the diminishing returns do not allow for the upgradation of machinery which again leads to lower profits. This vicious cycle continues making the unit sick. The inefficient and uneconomic nature of production in sugar mills coupled with low yield, heavy excise duties levied by the government are responsible for the high cost of production of sugar in India. Manipulation of stocks by sugar factories, hoarding by unscrupulous traders, black marketeering of sugar are choking the sugar production in India. The low yield of sugar cane, short crushing season and unsatisfactory location of sugar mills creates low milling efficiency and the recovery of sugar from sugarcane is quite low. The reason is not only short crushing seasons , the sugar mills do not possess their own sugar cane plantation as is the case with the west indies nor are they situated nearby sugarcane plantation. The sugar cane most often dries up before getting transported to the sugar mill. The sugar mills do not have control over quantity or quality and have to make do with whatever is brought to them by sugarcane farmers.The sugar industry is highly controlled one. There is a statutory minimum price (SMP) fixed by the central government, there is a state advised price fixed by State governments, which is in addition to the central government’s SMP. There is a levy to be paid. The government fixes export quotas. This whole scheme of government control is not good for the health of the sugarcane industry. The government must review its policies in order to make sugar industry a globally competitive unit.